Stumbling out of bed at 3.30 am every morning isn’t everyone’s cup of tea, but as Rich Wright from The Wobbly Cottage points out, “you don’t become a baker if you don’t like early starts”. Mind you, he hasn’t far to go as his artisan micro bakery is in Broadwindsor Craft Centre, only a short distance from the house he shares with his wife Dani and their children. 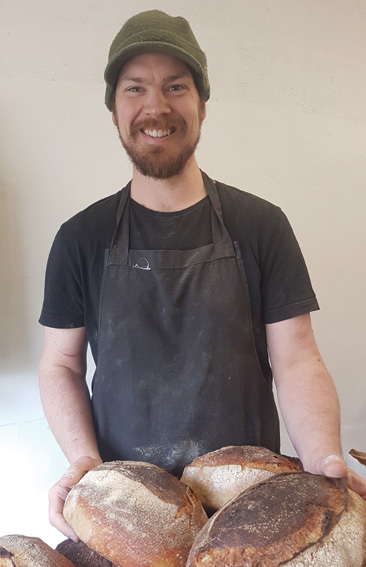 Baking by 4 am, Rich specialises in Sourdough bread, preferring ancient traditions and using local flour to create his crusty masterpieces. He bakes up to 450 loaves a week of the award-winning bread and also makes pastries, sausage rolls, chutneys and jams as well as his much sought-after scotch eggs. Dani is in charge of logistics and deliveries, supplying some of the most renowned pubs and restaurants in the area. The Wobbly Cottage is named after the cottage the couple first lived in when they moved to Stoke Abbott. It was snugly nestled in the middle of the village, with not a straight wall in sight. It is from here that Rich and Dani started their business, attending food and farmers markets at weekends with their jams, chutneys and freshly baked goods. As the sourdough proved to be the main breadwinner in their business, they realised they needed to expand from their domestic oven set-up. Happily, the unit at Broadwindsor Craft Centre became available at the same time, so the move took place. Now, thanks to crowdfunding, they have a commercial stone-shelf oven which bakes all their beautifully gnarly sourdough loaves and other bakeware. Having worked before in a windowless basement kitchen during his career as a chef, Rich is unperturbed by the long days. As he says, “now if I want some fresh air all I have to do is walk out the front door for a few minutes. If it’s a long day, then it means we’re busy, which means we’re doing something right.” Rising at such an early hour doesn’t translate into early nights for Rich. He specialises in power naps and can survive on four to five hours sleep a night. Sundays though are reserved for the kids. Then, Rich will cook and concentrate on his family, spending time at the beach together and generally relaxing…ready to start kneading and baking once more. He wouldn’t have it any other way.